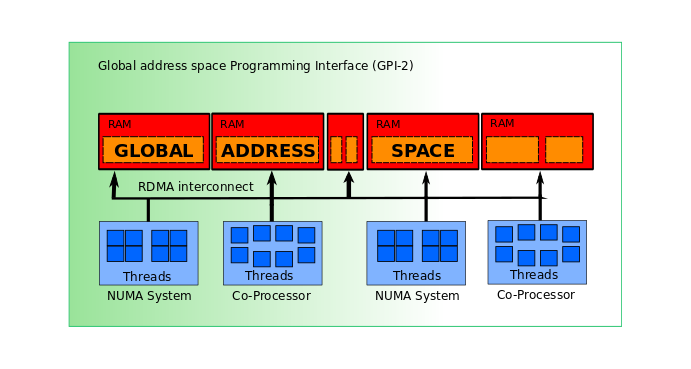 GPI-2 is the second generation of GPI, a product of the CC-HPC at the Fraunhofer ITWM that will continue to be supported and licensed . GPI-2 implements the GASPI specification (www.gaspi.de), an API specification which originates from the ideas and concepts GPI. GPI-2 is an API for asynchronous communication. It provides a flexible, scalable and fault tolerant interface for parallel applications. You can have a look at the API or have a look at some examples. You can also browse through the source code on Github. To get an overview of features and how to compile and run a parallel program, see the GASPI tutorial. GPI-2 is the next generation of GPI with more features. GPI has been evolving since 2005 and was known as FVM (Fraunhofer Virtual Machine) and in 2009 settled with the name GPI (Global address Programming Interface). GPI has completely replaced MPI at the Fraunhofer ITWM, where all products and research are based on GPI. In 2011, the Fraunhofer ITWM an its partners such as Fraunhofer SCAI, TUD, T-Systems SfR, DLR, KIT, FZJ, DWD and Scapos have initiated and launched the GASPI project to define a novel specification an API (GASPI based on GPI) and to make this novel specification a reliable, scalable and universal tool for the HPC community. GPI-2 is the first open source implementation. Shahzad, F. et al, Building a Fault Tolerant Application Using the GASPI Communication Layer. In: Proceedings of FTS 2015 in conjunction with IEEE Cluster 2015 : IEEE, 2015, S. 580-587.
ssh server running on compute nodes (requiring no password). GPI-2 (and GASPI) provides interesting and distinguishing concepts. Modern hardware typically involves a hierarchy of memory with respect to the bandwidth and latency of read and write accesses. Within that hierarchy are non-uniform memory access (NUMA) partitions, solid state devices (SSDs), graphical processing unit (GPU) memory or many integrated cores (MIC) memory. The memory segments are supposed to map this variety of hardware layers to the software layer. In the spirit of the PGAS approach, these GASPI segments may be globally accessible from every thread of every GASPI process. GASPI segments can also be used to leverage different memory models within a single application or to even run different applications. A group is a subset of all ranks. The group members have common collective operations. A collective operation on a group is then restricted to the ranks forming that group. There is a initial group (GASPI_GROUP_ALL) from which all ranks are members. Forming a group involves 3 steps: creation, addition and a commit. These operations must be performed by all ranks forming the group. The creation is performed using gaspi_group_create. If this operation is successful, ranks can be added to the created group using gaspi_group_add. To be able to use the created group, all ranks added to it must commit to the group. This is performed using gaspi_group_commit, a collective operation between the ranks in the group. One-sided asynchronous communication is the basic communication mechanism provided by GPI-2. The one-sided communication comes in two flavors. There are read and write operations (single or in a list) from and into allocated segments. Moreover, the write operations are extended with notifications to enable remote completion events which a remote rank can react on. One-sided operations are non-blocking and asynchronous, allowing the program to continue its execution along with the data transfer. There is the possibility to use different queues for communication requests where each request can be submitted to one of the queues. These queues allow more scalability and can be used as channels for different types of requests where similar types of requests are queued and then get synchronised together but independently from the other ones (separation of concerns). GPI-2 provides atomic operations such that variables can be manipulated atomically. There are two basic atomic operations: fetch_and_add and compare_and_swap. The values can be used as global shared variables and to synchronise processes or events. the shortest time possible, i. e. the time in which the procedure call processes an atomic portion of its work.